U.S. Secretary of State John Kerry addresses Chinese Foreign Minister Wang Yi and his delegation at the National Convention Center in Vientiane, Laos, on July 25, 2016, during the outset of a bilateral meeting on the sidelines the annual meeting of the ASEAN meeting. The importance of adhering to the Philippines-China arbitration ruling on the South China Sea by the Hague, and upholding international law was emphasized by attendees during a separate ministerial meeting between the Association of Southeast Asian Nations (ASEAN) and the United States. "We're very proud to be ASEAN's partner because you are speaking up for a rules-based international system that protects the rights of all nations, whether big or small," said U.S. Secretary of State John Kerry. 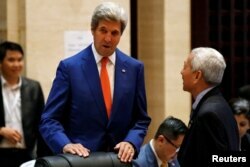 Kerry and his ASEAN counterparts also agreed on the importance of full implementation of United Nations Security Council Resolution 2270 to curb North Korea's nuclear and ballistic missile programs. During one of many bilateral meetings with his counterparts from the region, Kerry and Laos Foreign Minister Saleumxay Kommasith noted the increasing strength of U.S.-Laos relations, including engagement on health, the environment, energy, education, trade and investment. U.S. Secretary of State John Kerry greets Philippine Foreign Secretary Perfecto Yasay as he arrives at a meeting on the sidelines of the ASEAN foreign ministers in Vientiane, Laos July 25, 2016. The U.S. remains committed to continued assistance and cooperation to remove unexploded ordnance (UXO) and expressed appreciation for Laos support over many years to account for our missing personnel, said State Department deputy spokesman Mark Toner in a statement. Laos is ASEAN's chair this year. This landlocked country also is a close ally of neighboring China. The meetings in Laos follow a recent ruling by the international court of arbitration that largely invalidated most of China's claims in the South China Sea, leading to worries the decision could intensify tensions and lead to more Chinese military maneuvers. In Beijing, White House National Security Adviser Susan Rice told Chinese State Councilor Yang Jiechi on Monday that Washington will work with Beijing on issues and challenges "in candor and openness." A senior State Department (unnamed) official told reporters the U.S. will certainly be "an active editor" in the process of "helping the chair to develop a joint statement" coming out of the East Asia Summit ministerial and the ASEAN Regional Forum meeting scheduled for Tuesday. He advocated to "put a little more value on the conversation that happens among the ministers themselves" than "in the often lengthy and torturous prose" pulled together afterward. 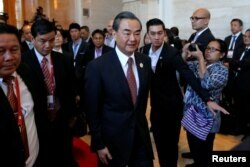 China's Foreign Minister Wang Yi arrives at a meeting at the sidelines of the ASEAN foreign ministers meeting in Vientiane, Laos July 25, 2016. In 2012, ASEAN leaders failed to produce a joint statement due to the objections of Cambodia, a close ally of China and the host nation that year. Cambodia was blocking any joint statement this year that referred to the Hague ruling. The United States signed the ASEAN-U.S. Strategic Partnership last November. Earlier this year, U.S. President Barack Obama hosted a summit with the leaders from the ASEAN countries. This year marks the 25th anniversary of the dialogue relationship between China and ASEAN. Earlier this month, leaders from both sides exchanged congratulatory messages. China, ASEAN's biggest trading partner, became ASEAN's dialogue partner in 1991. Both established a strategic partnership in 2003, and built the ASEAN-China Free Trade Area in 2010.